1 Almost everyone has heard of Taz. He's one of the Looney Tunes characters, and he had his own series on TV. Taz lives with his family in a cave and eats everything in sight, but what he really likes to do is find adventures. 2 Taz is named after the real Tasmanian devils, animals that live in Tasmania. Real Tasmanian devils are marsupials, like the kangaroo, another Australian animal. They are fierce animals that hunt by night and spend their day in a cave like Taz himself. 3 Tasmanian devils are also a protected species because there are not so many of them left. 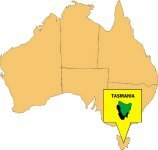 They live in Tasmania, one of the six states that make up Australia. Tasmania is an island off the southeast coast of mainland Australia. At one time Tasmanian devils lived on the mainland of Australia too, but not any longer. Now if you want to hear these 20-pound marsupials shriek, snort, and snarl, you will have to go explore Tasmania itself.